The new A8 will borrow styling cues from the Prologue concept, shown. MUNICH -- Audi will become the latest automaker to use 48-volt mild hybrid models in its cars to improve fuel economy and lower emissions. The automaker's latest A8 sedan, which will go on sale later this year, will be equipped with a 48-volt lithium battery and a belt-driven alternator/starter that recuperates energy during braking and stores it in the battery. The system will be standard on all A8 models, both gasoline and diesel. Audi plans to "very quickly" extend the system's use on its larger model lines, Alexander Kruse, the automaker's head of mild hybrid systems, said at a technical day at the Audi Forum in Munich Airport on Tuesday. The new generations of the A6 and A7 models will have the technology. 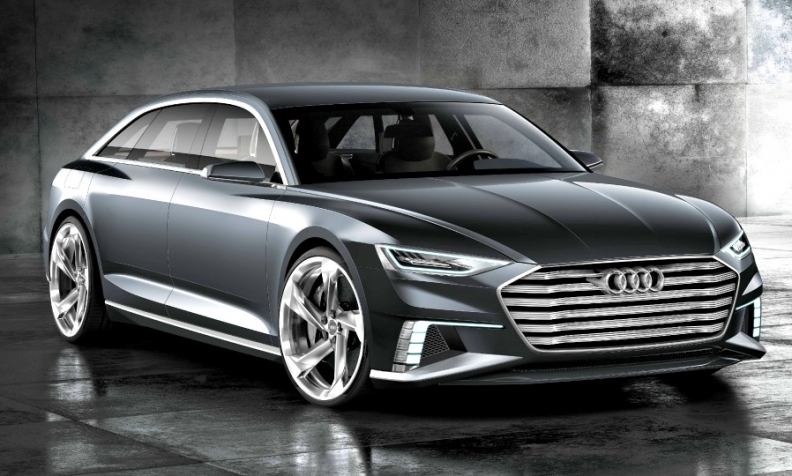 The A7 is due to debut at the Frankfurt auto show in September, while the A6 is set to launch next year. Kruse said Audi's smaller models will not use a 48-volt lithium ion battery but will instead have a lighter, more conventional battery that provides less torque for shorter periods. Recuperated energy stored in the battery can provide additional power of up to 12 kilowatts and 60 Newton meters of torque. Thus, the 48-volt system can help reduce consumption of a V-6 gasoline engine by up to 0.7 liters per 100 km in the New European Driving Cycle, Audi said. Other automakers using 48-volt tech include Mercedes-Benz, which will offer a 48-volt power system on its face-lifted S-class flagship arriving in European showrooms next month. Renault is offering a 48-volt mild hybrid system on diesel models of its Megane hatchback and Scenic minivan. Automakers are turning to 48-volt mild hybrids to help meet stricter fuel economy and emissions targets as the cost of adapting diesel engines to meet tougher regulations is rising. In the A8, the 48-volt system will help reduce fuel consumption when the engine restarts after coasting. The A8 can coast for up to 45 seconds with the engine turned off at speeds between 30 kph and 160 kph (19 mph to 99 mph). Once the driver accelerates again – whether from a stop or while driving – the alternator/starter revs up the engine to the target speed. In many situations, recovery of energy during deceleration is more efficient than coasting. To decide between the two, the A8 has a drive management system that uses a front camera and, optionally, data from a predictive efficiency assistant, the route data stored in the navigation system and other data supplied by the car sensors. The Audi vehicles equipped with 48-volt mild hybrid systems will also have a separate 12-volt battery to power lights, air conditioning, the engine control unit and other equipment, and a separate starter for cold start. The 48-volt mild hybrid is parts of Audi's strategy to improve fuel economy in its gasoline and diesel engines. The automaker's powertrain development department is working on cylinder-on-demand technology for V-6 and V-8 engines. Audi is also expanding its CNG-powered range with two models - the A4 Avant g-tron and the A5 Sportback g-tron. Audi will unveil its fourth-generation A8 on July 11 during what the automaker calls "the first Audi Summit." The sedan will have advanced autonomous driving technology and will mark the start of a new styling direction for the brand.